I was asked recently did I enjoy the time to sit back and watch daytime tv now the flowers were over for the season? This made me laugh as it couldn’t be further from the truth! Here’s a little insight into what I get up to when the flowers stop growing. November this year was a month of very few flowers. Some years I am lucky and the season keeps going for longer. Early frosts in October this year brought the flowers to an abrupt end. Wouldn’t it be great to think the end of the flower season meant I could sit with my slippers on, feet up in front of the wood burning stove with a cup of tea browsing through seed catalogues and grand designs on in the background! Back to reality and it is jumpers, wellies, hat and waterproofs on and out into the garden for the muddy task of the day. Some days I find it really easy to go out and work if dressed in the right gear and other days its damp and cold and a bit of a boost is needed in the form of chocolate! It’s a physically demanding time of year and I am often working outside in cold muddy wet conditions. This week I was in the playground at pick up time to have streaks of mud on my face pointed out. I must start looking in a mirror more often! My birthday comes at just the right time and the girls get me stocked up with dairy milk for the digging and clearing to come. It might not sound much fun but I still get that buzz from clearing the perennials in the bed and finding the new growth for next year just peaking through the soil or the happy sense of peace that comes from digging in the garden with my friendly robin beside me. I continue collecting seeds from the finished flower heads and press the last flowers that are still growing. The beds start to be cleared. All annuals need pulled up and perennials cut back. The annuals are then chopped into small pieces and wheelbarrowed down to the compost heap. Making good compost really helps mulch the beds next year. I never finish the job of clearing the beds before Christmas as I keep the plants in until the last flower has gone and I always start this job too late. It has also been hampered due to lack of access to the top flower patch while the building work in our back garden goes on. There will be plenty time in January as long as we are not under snow to finish the clearing and next year I will be more organised! The 215 dahlias I planted out in June need lifted, dried and wrapped for storage over the winter. This process takes me a few weeks as I only have enough space to lay them out to dry off in batches. I enjoyed the company of a curious robin who perched on my spade or the ground beside me singing whilst I dug. I have experimented with keeping a few dahlias in the ground over the winter but in our Scottish climate they rot. I have never lost any dahlias by lifting them and storing them. I have marked out my new beds in the front garden and they are ready for top soil. This involved me moving a lot of barrows of soil up and down the front garden hill. The chocolate is definitely needed here. I have got about 3/4 of the beds done now and hope to fence this new area and cover the paths with ground cover matting in January and February. This month I have spent some time giving talks to local groups. I spent a lovely afternoon with the Innerleithen Church Guild and then a morning with children at Priorsford primary school. I have done a few talks to adults about flower farming but it was my first time speaking with children. I was so keen to engage them with my love of flowers, nature, the outdoors and gardening. Without flowers growing I had to think of some new ideas to make my talk interesting. I took in some dahlia tubers, corms and seeds and showed the children that these very strange looking objects can grow into the most beautiful of flowers. I took with me lots of seed heads for the children to split open and find the seeds inside. They then collected these up to grow in the school poly tunnel in the spring. I love that the school has such an amazing facility to encourage a lifelong love of gardening and growing from an early age. I hope I can work more with children in the future. Below is a picture of the dahlia tubers I brought in to show the children and a picture of what I showed them they turn into. I still find this an amazing process as they do look like a bunch of funny potatoes incapable of growing into anything. Inside I have been successionally soaking and chitting my ranunculus and anemone corms. I then plant these up individually to grow on over the winter and provide early spring flowers. It is colder now so I don’t need to water as much but every week I must check and water my annual seedlings in the conservatory and also the bulbs I am forcing in the garage. Last week I finished the tulip planting. I have planted many of these in trenches outside in the flower patch and also some in crates. I have not tried this before but with spring weddings this year I need to make sure I have flowers in bloom. If I plant in crates and the weather is like it was this year with lots of snow and freezing temperatures I can take the tulips inside and bring them on there. Tulips are always one of the biggest financial investments of the year. The bulbs are very expensive and take a lot of work to plant. You then never have any guarantee they will bloom when you need them too. For example I did not have tulips blooming in April at all this year, they all came in May whether or not they were early or late varieties. So its head vs heart. My head says you don’t need many tulips, enough for your weddings and a few to sell as bunches as I don’t sell enough to warrant buying thousands. However the lure of the glossy catalogues dropping through my door more often than not makes my heart win. I just love tulips! I love the varieties that are different to what you might find in the supermarket, for example the beautiful fringed tulips. I can justify buying them by offering my customers tulips that are beautiful and different to what you would find anywhere else. Its now Christmas at Cloudberry Flowers! I just love this time of year and I am looking forward to getting stuck into Christmas wreath making this week. There is still time to order your wreath this year, just get in touch anytime. I have been working on all my Christmas homegrown and handmade decorations to give you some ideas for something a little bit different this year. What do you get your granny, mum or auntie who have everything? I came up with making up bulb baskets as I know that plants flowering inside in January, February and March is something nice to cheer relatives up on dark winter days. My gift boxes of cards were for designed with the idea they would be great for someone who always likes to have a nice card to hand in the house to send throughout the year. What do you get for that work secret Santa present or to fill a hamper? My seed jars and mini hanging frames with pressed flowers are something small and a little bit different to give as a gift. Christmas wouldn’t be Christmas at Cloudberry Flowers without my sparkly alliums. I started growing this years ones this time last year when I planted the bulbs. They flowered in June and I cut them to dry in July and August. In October and November I spray them silver ready for Christmas. Great as a mixture in a vase or as a star at the top of your Christmas tree, they look fabulous. December will be a month of wreath making. I get the moss and all the foliage from the garden to make them. This week I rake the moss out the ground and start mossing up the wreaths and next week I will start cutting the foliage and building the wreaths up into something beautiful. Last year I decorated my Christmas Day table with my wreaths with candles and it looked fantastic so I will be offering these for sale this year too. Wreath arrangements for your table dry out awfully easily in a heated house so make sure you keep them cool and give the foliage and moss a drink to prevent them drying out. In November I also bought a card machine so I can take card payments as well as cash. I know myself that I just do not use cash in the same way as I did years ago and if I was shopping I would prefer to use a card to pay. I hope this helps make visiting Cloudberry Flowers easier for my customers. Looking ahead to next year I am excited by the weddings I have booked in and the growing has already started for these. It will be the start of Cloudberry Flowers 5th year and I am looking forward to having some lovely flowers back on the stall for my customers, where it all started in 2014. I have learnt so much and know the one thing missing from my job is sharing my love of growing with you. I would love to develop workshops for you here at Cloudberry Flowers. I had great intentions to start these this coming spring but building work at our house has revealed some major drainage issues that need to be fixed involving a lot of excavation of the back garden in the spring. Once I get my garden back I can focus on getting these off the ground and sharing my love of flowers and growing with you. Have a fabulous festive season and I am looking forward to seeing you in the coming weeks if you pop into visit Cloudberry Flowers at its Christmas openings. Time has ran away with me again and it is a long time since I last wrote on my blog. This has been my 4th growing season and it has been the strangest yet for weather conditions. It has taught me that each year will never be predictable and I will never stop changing what I do and adapting to the weather as it comes. This spring was very slow in coming with the tulips all blooming in May rather than successionally from late March onwards. I had planted a lot of hyacinths to flower over a few weeks but they all came out in a day. It did mean a lot of wastage as I couldn’t use them all at once in arrangements but they did look beautiful in the flower patch. Then we had the arrival of some very good weather which brought all the annuals on quickly. The lack of rain meant many an hour watering outside morning and late evenings. Due to the lack of water some annuals that usually would last months flowering were going over very quickly, with just a single flush of blooms. The sweet peas were the best they had been since I started growing them. They were glorious for a few weeks but then due to the weather the stems got very short and were fine in mini jam jars but couldn’t be used in wedding work. Summer was beautiful and the flowers were amazing. I spent time on Prince Edward Island in Nova Scotia and came away inspired by the beautiful wild flowers there. The friendly people and magic of the island put it firmly at the top of places I would like to return to. The beauty of its coastlines, fertile farmland and wild flower meadows left me feeling happy, revived and ready to crack on in the garden when I came home. As soon as the schools went back there was a definite change in the air. Autumn feels it has come very early with much colder mornings and damp dark days. Many of the annuals are slowing down now and it has been a good time to start collecting seeds. I like to make up mixed jars of seeds which make great presents and are available to order now as well as being in my christmas shop. The annuals might be slowing down but the autumn flowers are just hitting their stride with chrysanthemums, dahlias, scabious, amaranthus, cosmos and soon to be asters stealing the show. So what has worked well this season in the unexpected weather? My proudest achievement this year has been my dahlias. The last 4 years I have fallen in love with a frustrating flower I have not been able to grow. I have had minimal flowers for the amount of effort and plants I had been growing. Any I did have tended to be nibbled by earwigs, slugs and thrips. If I had 1 or 2 perfect flowers I was lucky. This year they have been glorious. That is not to say all of them are perfect, there are still a fair few nibbled ones out there, but I have had many stems of strong beautiful blooms. I couldn’t pinpoint the exact reason for this as I have changed a few things at the same time. Many but not all of my dahlias are growing in the new front garden flower patch so perhaps the light levels here suit them. Having said that the ones in the initial flower patch have also been good. I have been working on soil improvement a lot with the addition of compost to the beds in the winter. This was the first year I divided my dahlias before potting them up in the spring. I have also been using bloom bags to protect the buds of my wedding flowers from thrips. All of these things may have helped and next year I am full of enthusiasm for expanding these beautiful flowers. The sweet peas were the best they have been in the last 4 years and the only reasons I can think of for this are the good weather and the fact that they were planted in the new front garden ‘no dig’ flower beds. I planted some at the back flower patch this year too which were very disappointing in comparison to the ones at the front. The ‘no dig’ flower beds have been an amazing success. To think that that part of the garden was just lawn this time last year and now look at what it has become! I am so happy with the success of these that I want to make some on the right hand side of the garden at the front so we have flowers down both sides. We can’t work out what to do here though as this is where I grow my bulbs and marking out new beds around these is difficult. Maybe a project for the winter. My garden gate stall has always been just surviving for the last few years. It has had days to weeks of being very quiet with nothing selling and other days where I would sell a few flowers. The bonus for us on the quiet days was getting to enjoy the flowers that did not sell in our home. I have always dreamed of a busy stall with people dropping in to treat themselves, pick up a jar of flowers for a friend or nip in on the way home from work to get some flowers for your partner as a surprise. This year the stall has become busier and I have enjoyed meeting new people popping in. Growing a business takes time and patience and I am so grateful to everyone who has come to support my flowers. So a very big thank you to you if you are a regular customer or have told a friend or relative about it. It means an awful lot! Another success of the stall as well as being gradually busier is having it open every day. I started this when Erin went to school and it has worked really well. I now know that you like to be able to pick up flowers on weekdays as well as weekends. This year on the stall as well as liking your jars of mixed flowers you have enjoyed buying dahlias and sweet peas by the stem or as a wee bunch. I would love to know if there are any other varieties of flower you would like me to grow that I could offer by the stem for you to arrange at home or as a wee bunch? I am hoping there will be a good few weeks of flowers left throughout October and if I am lucky into November. From the 29th September the stall will be moving across the driveway back under the tree to allow builders access where the stall is now. There will still be flowers everyday so please just pop in and you will find it in its new spot. As well as the successes there are always some failures in the garden and this year it has been the narcissi and the zinnias. The winter weather went for the daffodils and narcissi and they came through in much smaller numbers and later than usual this year. The zinnias were a flower I grew in my first season. I had a few flowers but they were not very productive and I decided not to grow them in seasons 2 and 3. However I am a bit stubborn and don’t like to be defeated. This year I decided to try again. I thought as Zinnias like sunny weather they would work. Again they have produced very small numbers of flowers on weak stems. I think it is time to let growers in Southern England grow the zinnias and concentrate on the flowers I know grow well here. The other failure of the year is the grass. You may have noticed it looks more like a field than a lawn! We have had 4 lawnmower break downs this summer including the end of the life of the sit on mower. Some lawnmower incidents definitely come back to the girls and their imaginary games. A metal bar buried from some game in the middle of the grass put paid to the mower at one point. Other problems with the mowers were just unfixable and now we need to find a new sit on mower for the start of the spring next year. In the meantime it has been suggested to us we should get some sheep! If you have visited the stall in the last few months you may be be wondering why we have pulled apart the round bed on the opposite side with the oval hedge surrounding it. The bed here contained a number of shrubs which had outgrown their space and the soil was poor for anything to grow in. We have replanted the large shrubs at the bottom of the garden and will flatten this area using the soil elsewhere. Eventually my dream would be to have a greenhouse there with lots of pots of flowers outside that I could take into the greenhouse to overwinter there. I have enjoyed making gift bouquets this year. The flowers are always special as they are handpicked from the garden to mark an important occasion. You have ordered flowers for birthdays, anniversary’s, moving into a new house, the arrival of a new baby and starting a new job. Sometimes I have arranged flowers as somebody just wants to say thank you or get well soon. I like my bouquets to be as fresh as can be so offer them in water. In the past I have aqua packed them in cellophane but I wanted to reduce my use of this. Now I offer bouquets in jars of water within a kraft living vase. I have enjoyed my wedding work this year. Every wedding is different with couples having their own ideas to incorporate flowers into their big day. I have supplied many buckets of flowers this season as more and more couples like to arrange their own flowers with friends and family. Dates are getting booked up for 2019/2020 now so if you are interested in locally grown flowers for your wedding please get in touch. At this time of year Christmas seems very far away but already I have started to think about it. It has been the perfect time to spray the alliums that I have been drying whilst the weather is good outside. I hope you will enjoy them as part of your Christmas decorations this year. On rainy days I am making as many pressed flower cards as I can so I have a good stock over the winter. I am also making up gift boxes of cards which make great birthday or Christmas presents. Over the summer I make as much biodegradable confetti as I can. This year I have grown much more larkspur, one of my favourite flowers and it makes an excellent addition to the confetti mix. I store my confetti in airtight kilner jars in the airing cupboard. This provides the perfect dry dark atmosphere for storing it. If you would like any confetti for a wedding or event please just get in touch to order. As autumn approaches the flower patch gradually winds down. It is a busy time outside with bulb planting to do, pulling apart beds, composting, mulching and arranging the autumn flowers. There is always the tax return and accounts to do and this winter I will be working on my new website. As the days grow shorter I start to plan for the coming year and one of my hopes is to start running workshops. I would love to share my garden, flowers and what I have learned with you. I also have a love of baking and really like the idea of running workshops along a particular theme with the flowers and including refreshments with homemade cake. At the moment I would love your ideas. Would you be interested in workshops? Would you like 1 to 1 workshops or groups ones with 6-8 people? Would weekends, weekdays or evenings work best? Would you like to spend a whole day in the garden with a light lunch or a couple of hours with cake and tea/coffee? I would love to know your thoughts. My initial plan was to start my first ones in March but I think it is likely building work on our house may still be going on then. It will all depend on that winter weather but I am excited to start sharing what I love with you. 2019 will be Cloudberry flowers 5th birthday. I have so enjoyed the last few years, learning about gardening, flowers and finding myself and my creative side again after having the girls. There are so many things that I am still hoping to do and I am looking forward to sharing my flowers and new projects with you over the coming years. The roses and cornflowers starting to bloom in the garden signals the start of a new confetti making season for me. Over the last couple of years, I have experimented with growing and drying different flower petals in my garden until I found my favourite, unique and special mixture to make my biodegradable confetti. Here is a bit of an insight into what I have been doing in the last two weeks to start making this year’s supply. As soon as I spot the first roses and cornflowers blooming in the garden I get ready to make new confetti. I wait for a good dry day and with a clean pair of snips go around my garden to find my flowers. I am fussy about the ones I use for my confetti. They must have newly opened up to reveal their petals and be completely dry when I cut them. Any petals starting to go over with mottled edges or wet marks are no good and rejected. Some roses work well to dry and others not. I know now which are my favourites in the garden to use for confetti and the others are left to enjoy. All my cornflowers in their varying colours make excellent confetti and I add larkspur, calendula and lavender to this if it is in season. When I have cut my flowers they are laid out separately and checked again. If they are cornflowers, calendula or larkspur they are dried whole but if they are roses I separate out each petal, again checking for any marks and only keeping the perfect ones. These are then laid out to dry. If it is a hot dry day outside with no wind they can dry there or in trays in my conservatory where it is nice and warm. It normally takes a couple of days for the petals to become very dry and ready to be mixed. The confetti is then kept in air tight jars in my airing cupboard. The dry dark environment of this storage space means that the confetti will keep well for months. It is a long time now since any towels or linen were in my airing cupboard! When I receive an order for confetti I measure it into a jug to the 1 litre mark and then carefully pour it into a cellophane gift bag and tie it with twine, ready for an event or wedding. 1 litre of confetti is enough for 10-12 handfuls. I continue making confetti each year from June until October or November depending on the frosts. As it stores so well it is available all year round. People have asked me before if the confetti has any scent. It actually loses the scent of the roses during the drying process and I don’t like to add any artificial scent into the confetti, preferring to keep it as natural as possible. If lavender has been in season and added to some of the bags it may have a faint scent from this. To be given to your guests to throw at your wedding. As well as 1 litre bags of confetti for weddings and events I also make smaller kraft boxes for guests to take which provides enough for 1-2 handfuls to throw over the bride and groom. I have loved developing my recipe for confetti over the last few years, annually planning what to grow for it and then handpicking those flowers when they bloom. My confetti is colourful, eco friendly, biodegradable, handpicked, homegrown in Scotland and made with a lot of love. I hope you like it and please just get in touch anytime if you would like more information or to order some for your event or wedding. Scented sweet peas, lily of the valley, astilbe, astrantia, forget-me-nots and sprigs of myrtle. Meghan’s bouquet at the royal wedding highlighted the beauty of the countryside and seasonal British flowers. Flowers which have been locally grown can add a really personal, unique and special touch to your big day. Locally grown flowers follow nature and its seasons and that means that if you are really set on having peonies at your wedding you would have to get married in June when they flower. Or if you love dahlias you would want to get married in late summer or autumn. I like to provide flowers for a couple and their family that you will always remember and where possible tie them in with a colour scheme or any personal preferences they might have. The process of growing wedding flowers can start over a year in advance so my blog this month is to help you, if you are thinking of booking flowers for your wedding. Not everyone can book their wedding flowers so far in advance. What can you do if you get engaged in March and are getting married in July? You can definitely still book homegrown flowers for your wedding. However, this is where you need to be flexible and happy to have whichever flowers and colours are blooming best in the garden at the time of your wedding. I will already have planted all the bulbs and seeds for that year but will be able to tell you what I have in and what I can predict is likely to be in flower on your wedding date. I would be very happy to speak with you about your wedding flowers if you are getting married later this summer or autumn. What if you are a bride who would just like a few buckets to arrange your own flowers? For this I would first get in touch to see what availability there would be. This will depend on the time of year and other bookings I already have. Usually for just a couple of buckets I wouldn’t need more than a months notice. Larger orders of several buckets I would need 3+ months notice. Lets have a look now at weddings at different times of the year, the flowers likely to be in bloom and when is best to book. I recommend booking your wedding flowers by June of the previous year to your wedding. A lot of the flowers I grow for spring weddings are bulbs and I have to order these in July of each year. I will plant them in the autumn and they will flower the following March-May. Bulbs can be ordered later than July but many of the varieties I grow will have sold out by even August/September which is why I like to get organised early. Flowers you can look forward to in April are hyacinths, fritillaries, early tulips, narcissi/daffodils, muscari, hellebores and honesty. You can have a bright bouquet with all the colours of spring or if you order before July I can work with a colour scheme that you like. For example I have a bride next year who booked 18 months in advance and would like a white colour scheme. As she booked before the bulb order date I can plant white tulips, narcissi, hyacinth, fritillary and muscari for her and I have also been planting white hellebores this spring. I can provide homegrown flowers for weddings from April. March in Scotland is too early for enough flowers and I would need to buy them in. The weather is unpredictable and in some years I will have an abundance of flowers in April. In other years I will have very little and may still have to buy in flowers from growers in England who are further on in their season. For example, this year the winter was so long I had no tulips in April at all but in previous years I had an abundance. Flower growing can be very unpredictable even when you have been doing it for a few years! Again I would recommend booking your wedding flowers at least by the June of the previous year to your wedding. For May weddings I still make use of a lot of flowers from bulbs. With late tulips at the beginning and middle of the month through to alliums at the end of the month. May is the most difficult month for flower growers as it is often at the end of the flowering bulb season but the annuals we have grown from seed have not yet got going. Although challenging the colours of May are beautiful and can provide shades of blues, pinks, purples and whites. Here are some ideas of flowers that you may get in May: tulips, scented narcissi, hellebores, anemones, bluebells (early/mid May) hesperis, alliums, perennial cornflowers, aquilegia, jacobs ladder (mid/late May). From late June to September you start to get an abundance of flowers in the flower patch. Working within colour schemes becomes easier as there are many more flowers to work with. The annuals grown from seed such as cornflowers, corncockle, sweet peas, cerinthe, ammi, larkspur and nigella all come into flower. As summer moves on you have cosmos and scabious starting to bloom. The list really is endless! The perennials I have grown from seed also come into flower such as astrantia, feverfew daisies and grasses. If you are having a wedding between June and September I would recommend booking your flowers by the January of the year you are getting married at the latest. This is when I start to sow the seeds that will turn into your wedding flowers in the summer. October is the month where we get the first frosts and the flower patch slows down. Having said that, October weather can often be lovely and the flowers can keep going through November. Having homegrown flowers at your October wedding is possible and it just means I may have to source a few from other flower growers if I can’t provide enough myself. At this time of year you get some beautiful flowers such as dahlias, chrysanthemums, rudbeckia, scabious, helichrysum, cosmos, asters and often a second flush of flowers I have cut back like hesperis and astrantia. The colours are bold and bright and include reds, yellows and oranges. But it is possible to do smaller wedding orders in paler colours; there are just fewer flowers to use. I normally make my orders for tubers like dahlias before Christmas the year before you get married and start these off in pots indoors in March. I do have a large stock of my own dahlias but if you were very specific about colours of flowers you would like I recommend book in 10 months + in advance of your wedding. Paler colour schemes at October weddings. These were challenging due to many of the flowers being bold and bright in the flower patch. However there were some beautiful cosmos, helichrysum, scabious, asters and grasses that I grew which were in flower. Unfortunately I cannot provide flowers for weddings in November, December, January, February and March as the flower patch is dormant. However at this time of year I can provide beautiful confetti which I make from the flowers I grow. Please just get in touch anytime if you would like some confetti for your wedding at any time of the year. Growing your wedding flowers is one of the most rewarding parts of my job. I love to grow varieties for you which you love or are memorable to you. Maybe you remember a particular flower from your garden or a grandparent’s garden when growing up. Ordering your flowers well enough in advance means I can grow these special flowers for you and provide a truly unique part of your wedding. It has been a very long winter and the growing season is off to a very late start. But at long last there are signs of life in the garden and I can start to catch up on the many jobs that need done outside. It is so nice being back out there working, even in the rain! Growing flowers indoors has been a saviour this year for having early spring flowers and being able to fulfil my orders. I have also been able to buy in flowers that have been grown by colleagues in the South of England to use alongside my own for larger orders. Being able to provide flowers that have been grown in Britain is important to me and it is lovely to be able to buy from fellow growers if I need to. Next year I have some early weddings and we have no idea what kind of a winter we are going to get. Luckily my brides have booked over a year in advance and this means that I can plan the planting for them specifically. I will grow flowers both indoors and outdoors for their weddings to cover all weather conditions we might have thrown at us then. Booking so far in advance also means I can grow the colours of flowers they would like too. The flowers outside are a month behind so far which is the latest they have ever been since I started growing for you. Just a tiny bit of sunshine this week has been enough though, to get some hyacinths, narcissi and iris flowering. The daffodils are finally getting buds. I wonder if they will end up just flowering all at once rather than staggering themselves like they normally do? At long last the tulips are getting larger and the perennials are putting on new growth too. I always find this time so exciting to see my plants remerge after a cold winter and my seedlings come on indoors. Nothing can beat planting seeds and coming down in the morning to see a whole tray germinated overnight. Or going round the garden and seeing some aquilegia and astrantia leaves peeping out from the ground. Inside we are bursting at the seams with plants everywhere. In the last couple of weeks I have started hardening off a lot of my autumn sown hardy annual and perennials. This involves taken them all out in the daytime and then putting them all back at night as the temperature dips. With so many trays going in and out it can take a good half hour at the beginning and end of the day to do this. After a couple of weeks of doing this they are ready to plant out. We are not out of the woods yet with threats of ‘beast from the east 3’ looming! so any I am planting out are getting covered in heavy duty fleece to protect them. Today was the first day of planting out which felt such a satisfying thing to do after being stuck in limbo for so long, waiting for the snow to go. Below is a picture of some feverfew that I grew from seeds in August and now are ready to grow on outside. I have been trying out my new bulb auger I got as a present for Mother’s Day and boy does that make planting bulbs easier on areas of tough ground! I am looking forward to putting it to better use in the autumn. Here I am just transplanting some snowdrops from one area of the garden to another. I have been planting lots of new hellebores. Every year like my roses I like to add a few new ones. These ones are all a white variety to be used in spring bridal work next year. Many people think that hellebores do not make a good cut flower as they wilt, but if cut at the correct time and conditioned properly they are magnificent. I have been making new pressed flower cards with the flowers I have in bloom and these will be ready to go on the stall over the Easter weekend along with some jars of my first outdoor flowers, sempervivums, the last bulb baskets for this year and my seed jars. If you fancy having a go at growing some mixed cut flowers using seeds from the Cloudberry Flowers garden these little jars contain a good mixture of some of my favourite annual flowers. The stall is already open 7 days a week and as new flowers start coming into bloom more arrangements will be added daily so please pop along anytime for a treat for yourself or a gift for someone. Its time to get the dahlias out of storage. In late autumn after the first frosts I lifted these up and prepared them for storage. I tried a new technique of wrapping them in clingfilm I had been reading about and I was impressed to see they have all come through the winter with no shrivelling or rot. In the last few years I have just repotted my dahlias in the spring, brought them on inside and then planted them out after the last frosts. This year I have been dividing the tubers for the first time to give me more plants. To do this you must cut a tuber away from the old plant making sure that you have a few eyes on them. A tuber without eyes will not grow into a new plant. They look like little raised bumps close to the top of the tuber. Below you can see the original plant on the left and the 4 new tubers I have cut from it. Crows, pheasants and pigeons are a bit of a problem in our garden as well as the rabbits! They like to nibble on the narcissi so I have invested in some bird netting to put over the top of the growing flowers to keep them off. I have been laying more ground cover over the grass paths. This week I have been doing the ones surrounding the beds built in the front garden last year as I had some left over from doing the top flower patch. This will help cut down mowing time for Robert and keep the weeds and grass from getting into the beds. I have also been putting black polythene over particularly weedy areas over the winter, mulching the beds and laying fleece over the perennial bed to give them a head start getting established again. Inside I am still sowing seeds constantly. Up until now I have been sowing hardy annuals and perennials. This week I have started off the more tender annuals such as cosmos and statice. These will be brought on indoors until the risk of frost has past in late May, early June. Seed sowing starts in January each year with my first sweet peas, but did you know I will be sowing different types of seeds every week up until September. This is what allows me to bring you flowers right through from spring until late autumn. This blog has been all about the garden and me in waiting, on the brink of getting those first outdoor flowers. Next time I write my blog I am hoping to have lots of beautiful pictures to show you of them all blooming away and ready to find good homes. I am so looking forward to providing you with beautiful locally grown seasonal flowers again this year and if you would like to find out more about how you can buy them to enjoy please just get in touch anytime. Are you feeling creative and would love beautiful homegrown flowers for your wedding day? Do you like to arrange flowers in your house and would like some loose stems? Do you arrange the church flowers? Or maybe you run a business where you would like some loose flowers to arrange in a vase for your reception? 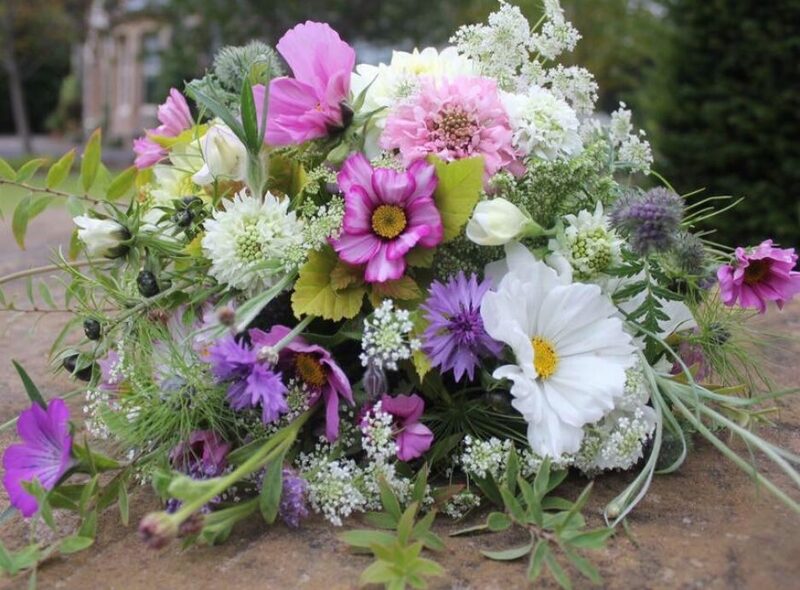 I can provide you with mixed buckets of beautiful flowers or loose stems, grown here in my garden in the Scottish Borders. They are seasonal, unique and super fresh. As well as growing popular cottage garden favourites I also grow less well known varieties, which make excellent cut flowers. Using my buckets of flowers for your wedding or event will mean your flowers will be completely unique. They are often scented too and are available from April to early October for weddings each year. Buckets of flowers are £50 for a DIY event bucket with 50-60 stems. This is enough to fill 4-6 jam jar arrangements or make a couple of bouquets. Buckets of flowers are usually collected on a Thursday or Friday morning for a Saturday wedding. I love to see what my couples and their families have been able to create with my buckets of flowers. Here are some pictures Leonie was happy to share from her big day, with the gorgeous arrangements she and her family made. You might feel that it would be too much pressure to arrange all your wedding flowers right before your wedding, but you still want to be creative. I also provide a ‘buckets and bouquets’ service where you can order buckets to arrange the tables yourself and I can arrange the bridal party flowers. You can enjoy the fun with family and friends arranging your flowers a couple of days before the wedding and then I can take over for the flowers that need to be arranged closer to the time. One of the things I often forget to do is photograph my buckets of flowers before they are collected. Here is a couple of snapshots of my flowers off to a wedding delivery. They were already in the boot of the car before I remembered to take the photographs! DIY flowers are a great option for you if you would like to do some of the arranging yourself for your wedding, you have creative friends and family who would love to help and you want beautiful natural unique flowers for your big day. DIY buckets of flowers are not just for weddings though. They are great for smaller events and businesses too. If you are arranging church flowers and would like stems of beautiful flowers cut straight from the garden please do get in touch. You do not need to be restricted to buying a whole bucket. If you just need a few stems that is absolutely fine too. Do you own a business where you would like loose flowers weekly or fortnightly to fill a vase on your reception desk? Or maybe you own a holiday cottage, B&B or hotel where you would like flowers to greet your guests. Flowers can be available by the bucket or in smaller numbers depending on what you need. Do you enjoy flower arranging and instead of buying a pre made bouquet you would prefer to arrange flowers yourself in your own vases? Please do get in touch for more information. I can provide you with as many flowers as you like freshly cut for you from the garden. Given the right after care these flowers can last an incredibly long time. Filling your venue or home for a party with flowers is a great way to make an impact. You can collect all sorts of vessels to contain your flowers from jam jars to gin bottles! Please do get in touch if you are having a party this year and would like some flowers. When should I order my loose flowers or buckets? If you would like more than one bucket of flowers please do book at least a month in advance. This allows me to check that I can provide enough flowers for you at the time you need them and that I have no other bookings for your event date. Ideally the more advance notice I have the more I can grow flowers to suit you and your event. For example if you are having a spring wedding having your buckets booked by the previous July will allow me to buy in bulbs in colours you would prefer. If you were getting married in the summer booking your buckets by the previous January means I can grow flowers from seeds to suit you. It is fine to book up to a month before your event but you will receive a mix of what is flowering best in the garden at the time without a choice of colours and varieties. If you would like 1-2 buckets please order at least 2 weeks prior to your event during April-October. If you would like a small flower arrangers bucket a few days notice will be all that is needed for me to cut and condition these for you. If it is just a few stems you would like, for example for church flowers please just pop by anytime or give me a ring. I am usually around to cut these for you on the day. In March, early April, late October or November please just double check with me that there are flowers available. Every year is different as the weather varies. Some years it is warm and there are lots of flowers in March and April. In other years they are buried under snow! Similarly in late October and November it can be warm and sunny and there are many beautiful flowers blooming. Yet other years there are a run of frosts in October ending the season earlier. Why should you buy loose flowers or buckets of flowers from me? Its very easy to pick up flowers in the supermarket for an affordable price so why should you buy loose flowers or buckets of flowers from me? There are so many good reasons, many of which gave me a reason to start growing flowers a few years ago. Homegrown flowers are all unique by the stem. They wont be perfectly straight and uniform but differ in height, shape and thickness. This adds character and a natural style to your arrangements. My loose flowers are often scented, which is so rare in supermarket flowers. My flowers are as fresh as they possibly could be. I bring clean buckets of fresh water out to the flower patch so that I can cut my flowers straight into them. They are then conditioned in my old stone garage which is cool and the perfect temperature to keep the flowers fresh for you until you. If you buy loose flowers from me you are buying something local that has been grown right on your doorstep and not travelled thousands of miles to get to you. You can order as many stems as you need rather than having to buy a whole bunch. My flowers are seasonal so you will not get a rose in March but you will get beautiful scented narcissi or early tulips. The flowers will vary from week to week as the season moves on so if you wanted some regular flowers for your home or business your arrangements will always look different. I love growing my flowers for you every year and would be delighted to provide you with any loose flowers that you need. To discuss flowers you might like regularly in the coming months or to order stems and buckets of flowers you can contact me by phone, email, facebook message or at the house. Please leave a message on the phone if you don’t get me as I am often in the flower patch gardening and might miss you. I will call you back as soon as I get your message. Growing and arranging wedding flowers really is the best job in the world. I grow flowers to bring a smile to someones face, to make someone happy and bring the colour, textures and scent of the garden into your life and special day. Last year I had the honour of growing flowers for some very special couples and here is a look back at my best bits from their weddings. My job is to grow some amazing flowers for local customers, florists and weddings. The flowers I grow for weddings can then be taken away in buckets for you to arrange yourself or I offer an arrangement service too. Buying buckets of flowers has become more popular as people like to gather the day before the wedding and get creative with their friends and family. It can be therapeutic, relaxing, fun, and as long as you leave yourself plenty time stress free. My couples have talked about what a special experience this has been. To gather together your friends and family the day before the wedding, spend some quality time together and have fun arranging flowers, with a glass or too of something fizzy is a happy special time. The great thing is you can do as much or as little as you like. You might want to do everything yourself and order a large quantity of buckets for this. Or you might want to order some buckets to arrange the table flowers yourself and ask me to arrange your bouquets and buttonholes. The flowers in the buckets change as the season and months move on and each wedding will have a unique combination of flowers. The flowers in the buckets above were from mid summer last year. If you prefer to have your flowers arranged I can do this too and last year I had a lot of fun creating some unique and special brides bouquets. My style of wedding bouquets are loose, natural, textured, scented and with a feel to them as if you have walked through the garden and gathered a bunch of your favourite flowers. Last year I loved growing grasses to include in my bouquets to add texture. One of my favourite flowers to use in the bouquets was larkspur as it provided spikes and trailing elements with beautiful delicate flowers. I am being asked more and more to make flower crowns for weddings both for brides and flower girls. Flower crowns can vary so much in their appearance from delicate, right through to statement pieces with larger flowers. I enjoyed developing ‘my style’ of crowns last year and after using a variety of flowers I have built up a good idea of what I think is the perfect combination. I like to use herbs, grasses, heathers and foliage I have grown, as well as my flowers. Flower crowns have to withstand a day and evening out of water, they have to survive the weather and the Scottish wind and need to made on the day of the wedding, as close to the time of delivery as possible. Flower crowns are always the last thing I make after the bouquets and buttonholes are all done and I just love them. Flower crowns are not for everyone and many of my brides and bridesmaids have enjoyed having individual flowers I have grown styled into their hair or had a hair comb made up. The hair comb below was for a wedding in Oban and needed to travel there two days before the wedding. Normally I would make any hair pieces on the day of the wedding as they need to withstand being out of water. I trialled a lot of the flowers I grew and settled on a combination of cornflowers, heather and statice. It lasted brilliantly throughout its journey and the wedding. Below you can see a photograph of the hair comb just before delivery on the Thursday and then a photograph on the day of the wedding on Saturday, still looking amazing. A wedding wouldn’t be a wedding without some beautiful biodegradable real petal confetti from the garden. Last year I was constantly making new batches as all my brides wanted to use some on their big day. Some of my couples liked to have it for their guests to throw and others like it for decorating their tables. I hope to keep making as much as I can this year as I just love it, for its colour, sense of fun, beauty, eco friendliness and compatibility with venues wanting you to use biodegradable products. I love making jar table arrangements for weddings as I can use the best mixture of flowers growing in the garden at the time. I try to give them different textures, colours, heights and scent so they can provide a talking point as people spot the flowers they grow in their own gardens or spot new ones they like. My jar arrangements are a nice gift for a couple to give away to guests to take home and enjoy at the end of the night. Many have said how long they have lasted after the wedding. Weddings have challenges and the biggest one for me is to fulfil a brief for a particular colour scheme. Growing flowers and not importing them means I have to work with what my flower patch provides for me. I can have an idea of what will be likely to flower in a particular month, but you cannot guarantee a specific colour or variety of flower to a couple. My most challenging wedding flowers last year were for my October weddings. The brief for both that month was pale pastel colours at a time of year when bright colourful in flowers such as dahlias, rudbeckia and helichrysum were more likely to be abundant. On top of this the weather was a lot worse than the year before and the flowers were slowing down much faster. The flower patch did not let me down and I was so happy to create the bouquets below for my brides full of cosmos, scabious, achillea, astrantia, nigella, larkspur, eucalyptus, herbs, grasses and pale helichrysum. Another wedding that provided a different challenge was Emma and Gavin’s at Hartree Estate near Biggar. Emma wanted me to see if I could decorate lace armbands with flowers for herself and her bridesmaids. I was unsure how well the flowers would attach to the lace but found a hot glue gun and using robust flowers that were unlikely to wilt worked well. The result was beautiful and unique. One wedding that was great fun to do was Samantha and Andrew’s in St Andrews. The large majority of my brides ask for pastel, pale colours but Samantha’s brief was bright and colourful. I was able to grow and arrange flowers I had not been able to before. She also wanted extra buckets of bright flowers to decorate parts of her venue and asked for sunflowers if possible. As with all my weddings I had to say that I couldn’t promise particular flowers as you just don’t know what will bloom that particular week, but I was determined to give it my best shot. I think Samantha was destined to have sunflowers at her wedding as despite the lack of sun and poor weather my sunflowers bloomed for her. They were amazing and my only regret is I completely forgot to take photographs of those buckets of flowers. Samantha’s bouquet lasted so long she has managed to dry it and keep it at home! Every year I like to learn new skills and different ways of displaying my homegrown flowers for weddings. This year my flowers were used to decorate wedding cakes and I also taught myself how to make wrist corsages. I love making pinned buttonholes and corsages. I can use some of the lovely shorter stemmed flowers I grow and combine them with seedpods, herbs, grasses and foliage to bring them to life, full of texture and scent. As well as fulfilling large orders I really enjoy making them one or two at a time for local customers attending a wedding. Please get in touch anytime you would like me to make you one. You might spot the kraft tags in some of the pictures. These have magnets attached to them so that a lady can attach the corsage to her bag or outfit without having to put a pin through it. Here are some of my favourite bridesmaid bouquets this year. How are they different to the brides bouquet? I make them slightly smaller with similar themed flowers but I do always reserve a few extra special ones to put in a brides bouquet. Its important to make it that bit different and the star of the show with the bridesmaids bouquets to complement it. I cannot do my weddings without the fantastic support of my family. Peak wedding season is also right across the school summer holidays and my girls are so good at being my helpers when I need them. Whether its holding a bouquet so I can see it from a different angle to add or remove a flower, trying on new hair flowers I am practicing, delivering flowers on a wedding day or knowing that mum just has to work those long hours on the day before a wedding but we will do something nice together in the days after. Robert and my mum and dad are so good at helping out with childcare or driving if I need an extra pair of hands at a city centre delivery without much parking. So this is a chance to say a big thank you to them for all their help and patience last year. A big thank you as well to all my wonderful couples from 2017 and their friends and families. You were fantastic to work with and I loved the opportunity to grow some amazing flowers for you. Looking forwards I am expanding the flower patch again and getting itchy feet to start growing my 2018 flowers. I am growing old favourites such as larkspur, cornflowers, ammi, phacelia and sweet peas and trying some new varieties this year too. I am excited about the future and my flowers. And just to finish off are you getting married or know someone that is? Are you a person like me that loves nature, flowers, the great outdoors and beautiful gardens? Do words such as beautiful, wild, natural, locally grown and scented pop into your head when you think of what you would like your wedding flowers to be like? If this sounds like you and you have a flexible approach to colour and varieties of flower then I would love to give you more information on what I can grow and arrange for you and your special day. In years gone by January has not been my favourite month. Its dark, damp and cold a lot of the time. Its past the excitement of Christmas and seeing lots of family and friends and spring time seems a long way away. January is a completely different month now I have found my passion in life growing cut flowers. By the end of December I am shattered from the physical work involved in growing them, the pressures of running a business and looking after my family. It is time for a break. Just as well Christmas holidays come along when they do and this year I really did try my best to have 2 weeks off. Now January comes round and I am a woman on a mission. My head is bursting with ideas for the flower patch, what varieties to grow, who I am going to sell my flowers to and I can’t wait to get going. My post Christmas body plays catch up as I start moving wheelbarrows full of weeds and compost around the garden. It does feel good to be outside doing something physical again and not sitting on the sofa watching Christmas TV with chocolate and whisky! Read on to find out what is happening in the flower patch at the moment and my plans for 2018. The first thing that is going this year are my grass paths in the top flower patch. I knew from reading about flower growing over the last few years that they were not ideal but I just couldn’t afford to change them. They have a huge upkeep with strimming, mowing and edging. The grass invades the beds and therefore the flowers, and looking after the paths was taking up so much precious time I could be devoting to growing. I have just invested in ground cover membrane and will cover the paths in these. You could mulch over the top of this with something like bark but that would be costly and could also be a good hiding place for those slugs that like to eat my dahlias. So my plan is to also use carpet. Having an old house that is an ongoing project means we have some carpet lifted that we kept hold of and more to replace over the next few years. I will use that over the top of the ground cover where needed. It might not be pretty but it will do the job and as a flower grower that is all I need. The second thing I have got going with is the creation of some new flower beds to extend those in the front garden. In October I went to a Flowers from the Farm conference where Charles Dowding gave a talk all about the benefits of ‘No Dig’. He was inspiring and what he said made so much sense to me. The idea is that soil develops its own structure, flowers grow more easily, theres better drainage and less weeds as the soil does not need to recover after digging. I have been really keen to give the no dig beds a go and see whether my flowers grow more successfully in them. They do require a good amount of compost so I had 7 tonne bags arrive last week. We have marked the new beds out and I have started to lay the cardboard down and mulch over the top with a good several inches of compost. Then the snow came so I have unfortunately lost a week of working on this. Compost on the beds makes all the difference when you are growing flowers. Now that I have so many beds I need a lot of compost. It is very expensive to buy in in the quantities I need so our own production really needs to increase. We have some really good compost bays at the bottom of the garden which we need to make the most of. Unfortunately they are as far away from the top flower patch as you can get and it is hard work going with the wheel barrow between them. It does help keep me fit though! We also collect leaves in the autumn to make leaf mould which is brilliant stuff. I know I also need to make sure I chop up some of the larger material I am putting on the heap and shred the woody stuff to make a better mix, which will decompose to good compost faster. Its the time of year again where I bury my self in enticing seed catalogues and place my orders for them, ready to start sowing in early spring. This will be my 4th season coming up and I now have a good idea of what I can grow successfully in the garden. I will be ordering lots of cornflowers, sweet peas, nigella, corncockle, ammi, calendula, larkspur, anttirinhum, and phacelia. I also want to retry growing stocks and zinnia this year which have had mixed success the last couple of seasons and I really want to try again. January is much too early to plant seeds as there are not enough hours of daylight and it is not warm enough even with a heat propagating mat in the conservatory. Every year I do get very itchy feet to start sowing seeds but this year I am trying really hard not to before February at least! The one exception is with sweet peas. They need a little warmth to germinate but can then be grown on in cooler conditions. the cool weather stops the plants getting too leggy and you will end up with healthier bushier plants as a result. This week I have planted my first sweet pea seeds. This will be more 4th season growing them. the 1st year they were excellent, the 2nd year very poor and the 3rd year I had moderate flowers. It will be interesting to see how well they do this time as I really do love them, not least for their gorgeous scent! I can’t sow many seeds at this time of year but the ones I sowed in August were getting too big for their trays so I have been potting them on this week. There are a few types of hardy annual that I can sow at the end of the summer and if I can get them to survive the winter they will produce bushier, healthier plants which flower earlier than spring sown seeds. Each year so far I have had some overwinter well outside producing fantastic flowers. However with this years cold winter it does not look like as many have survived in the garden. Inside so far they are doing well and if I can just get them through the next 2 months and then planted out successfully I should have some lovely flowers. Seedlings I am trying to overwinter include cornflowers, corncockle, larkspur, rudbeckia, scabious and hesperis. This year I am going to have the garden gate stall at the end of our driveway open 7 days a week from 9am until it gets dark in the evening. This will be all year round with bulb baskets in January and February and flowers from March onwards. In previous years I have had flowers on the stall mostly at weekends with a few extra days here and there if I had lots of flowers blooming. Since Erin my youngest daughter is now in school I have more hours in the day to work and I can look after the stall every day. When I first started cloudberry Flowers I used to fill the stall with as many flower jars as I could. I then realised when they didn’t all sell, the flowers were cut and would be wasted. This year I plan to put fewer jars out at one time but as soon as one sells freshly cut and arrange another to replace it. That way there will always be the freshest of flowers on the stall and less wastage. Last year I really wanted to supply local florists with homegrown flowers for their business. There are so many beautiful country garden flowers that you cannot get easily through wholesalers and I also wanted to provide a different option to florists. I wanted them to be able to buy 1 stem of a particular flower if thats what they needed rather than having to buy flowers in wraps of 25+ and not be able to use all of them. But I got more wedding bookings than I had anticipated and didn’t have the capacity to grow both for my wedding bookings, stall, bouquets and for my local florists. This year with increasing the size of the flower patches again I would love to revisit this. This is the bit of running a business that I like the least. I love to grow my flowers and I love for people to buy them and enjoy them, either in their own homes or to give as a gift. You can’t grow flowers and not market yourself as then you are left with a beautiful garden but no customers. Being tucked away in a quiet part of town you are unlikely to stumble across cloudberry Flowers so I need to reach out to you some other way. To begin with I always thought the best way was through Facebook. As time has gone on Facebook has changed its algorithms so that business posts are not displayed as much in peoples news feeds. You might like Cloudberry Flowers but that doesn’t mean Facebook will show you all of the posts from that page. Unfortunately that has meant to me over time that less people know about my flowers. With changes afoot again announced by Facebook this January it is time for a change in the way I let you know about my flowers. I would be delighted to start sending you your monthly updates with news, gardening tips, special offers and what flowers are blooming that month. Bouquets full of seasonal garden flowers will be available to order again from April right though to October/November. They come in small, medium and large sizes and can be aqua packed if you would like, so you don’t have to worry about them being out of water too long. Wedding bookings are coming in for 2018 and I am excited to start growing some wonderful flowers for my couples. If you are interested in having homegrown flowers for your wedding please do get in touch as early as you can. At this stage in the year I am just about to start sowing many of the annual seeds and if you have any particular flowers or colours you would like this is a good time to chat things through before all the plants are grown for the season. Here are a few pictures of flowers from last spring. I am looking forward to seeing them again soon and making some lovely arrangements for your jars and bouquets. They should be ready from March for jar arrangements and April for bouquets. My favourites were the fringed tulips I grew last year. The garden gate stall is open daily from 9am-until dark throughout January and February for bulb baskets. I planted these up back in September and kept them in a cool dark place to grow. They are now ready to bring in to the warmth and light for some colourful flowers in winter. Once they have flowered you can plant them in your own garden for flowers in future years. The snow has been beautiful, especially if you have been lucky enough not to need to drive in it. The girls have had a lot of fun with their snow days off school and the garden was made for children and mums and dads to have fun in! Sledging, igloo and snowman building has been the main activity of the day all week. It has meant that I have been very unproductive in the garden and set back a good bit on my schedule for getting some jobs done. As soon as that snow melts it will be time to get my wellies back on and get my wheelbarrow out but for now its snowing agin, its beautiful and I am off out for a bit more sledging time with the girls! I am glad we can say we had a proper winter this year! I tossed and turned a lot last night. I could hear the wind howling around the house. Surprisingly I had fallen asleep really quickly despite the storm outside and I was sure when I woke up it must be 4 or 5 in the morning. To my great disappointment it was only 2am. It was going to be a long night. Sleep was not for coming back to me hearing what was happening outside! There is nothing you can do in the middle of the night. It is pitch black and I had no way of knowing if the flower patch was flattened. I would just have to lie there and wait it out! I wonder if my fellow flower growers loose sleep on nights we have gales like I do? I manage to sleep fine even if it is raining or snowing, which can be just as damaging to flowers, but hearing the wind gets me every time! My sensible head says to me it is mid October, the natural end to a flower season. We could have had a frost at the beginning of October and it would all have been over then. Does it matter if the wind comes in and flattens the flower patch tonight? My heart though (which does tend to rule!) says I just want a few more weeks of beautiful flowers, they looked so lovely this morning. Last year there were flowers in November, can it not be the same this year, or is that a bit greedy?! It seems cruel to have the whole flower patch flattened in one fell swoop. I think I would prefer a gradual cooling of temperatures and shorter days, with a few occasional frosts and a slower end to the flowers. I love my job but by this time of year I am getting tired. Flower farming is physically and mentally tiring and by the end of the season with so many jobs still to do, planting bulbs, digging, mulching, pruning, dividing and clearing up for winter I could use the extra time without the flowers. And yet although it is inevitable and I know its coming I am not ready for the flowers to end. They are so extraordinary, beautiful and bring such pleasure to people. The end of the flowers also means the start of the winter! I finally must have fallen asleep again. I hear the alarm and then Kirsten coming in to say daddy needs your help outside, I think its the stall! With a sinking heart I grab jacket and wellies and go to see what needs to be done. Walking through the garden I can see garden furniture scattered and the barbecue fallen over. And then yes there is the roof of the stall not where it is supposed to be! The whole thing had toppled in the wind. Fortunately it does look like it can be fixed fairly easily, but there will be no flowers on it today! So what of the flower patch? I decided it was worth a quick look in my pyjamas. To begin with all you can see is the devastation after a storm. The broken stakes pulled out of the ground, the flattened flowers and the ripped tunnel sheeting. It does look like this might be it for this year. I hope my fellow growers and friends have come through the storm with polytunnels still where they are supposed to be and flowers still standing! On closer inspection after dropping the girls at school it would appear all is not quite lost! Yes there is definitely a lost bed of rudbeckia and snapdragons and half my cosmos bed is ripped out. The dahlias have had a good bashing and I have lost quite a few. But the scabious and helichrysum are still hanging on in there with some asters, thistles and astrantia. There are roses still in bud. These Scottish flowers are resilient and I know I can be too! Can we just press pause…. May was the last time I sat down to write on my blog. Now already we are approaching the school October holidays. This year at Cloudberry Flowers has been the fastest season yet. I am becoming more and more conscious of time passing too quickly and I would love to press pause and keep my girls just as they are. Kirsten and Anna are growing so fast and next year will see more change with Kirsten starting high school. She has not got far to go before she will be taller than me and if she keeps eating us out of house and home I think that time will come sooner rather than later! The biggest change has been Erin starting primary school. My little girl has grown up so much in just a few months and loves her days full of school and activities. I thought having the longer days without my wee chatterbox around would be long and quiet but amazingly the days go so quickly. I still don’t seem to have enough hours in them to truly do justice to our house, garden and Cloudberry Flowers. As wedding season is still in full swing it has kept me run off my feet and I have not had time for a quiet moment. Lunchtimes are when it hits me most that there is no small person there to share their stories with you. As a consequence I am not very good at stopping for lunch and eat on the run! I will need to work on that as I find physically working in the garden all day you do need a proper break in the day. Cloudberry Flowers continues to grow. I love that every day is different. I am always learning, whether it’s looking up a gardening book on best methods for planting or teaching myself a new skill such as making a wrist corsage or hair comb of flowers. I love to learn and it is amazing how you never stop in the garden and I don’t think I ever will. The flowers vary so much from season to season affected by so many variables. This year one bed of sweet peas was brilliant but at the opposite end of the patch a bed of them was really poor. My white cosmos are brilliant but my pink nearly non existent. The rudbeckia, chrysanthemums and dahlias just don’t want to flower this year but the cornflowers and scabious are proliferous. I am enjoying growing the confetti and cards side to my business as well as my flowers. Last year I always had a good stock of confetti. This year it has sold so much I am constantly making new batches. I have also loved my summer of weddings. They have challenged me, they have all been different and I have loved how natural seasonal flowers have looked so beautiful and been such a special part of many of my couples big days. I have 2 more weddings this season, which prove to be a big challenge at this time of year as you keep your fingers crossed jack frost stays away and the flowers survive what the weather throws at them, gale force winds tonight! All I can do is take as many precautions as I can staking flowers and covering them where I can to withstand the weather. Despite the stresses the weather brings weddings are such a special part of my job and arranging the flowers I have grown in my own style is one of the most fulfilling bits. Look out for a blog coming up soon where you can read all about this summers weddings. Here’s one of my bridal bouquets from this season and some table flowers. Weddings are also a challenge from a work life balance perspective. Peak wedding season falls right over the school summer holidays and each wedding takes along time to do. First foliage is cut and conditioned, then flowers need to be cut and conditioned. Table arrangements need to be made and then there is the brides bouquets, bridesmaids, flower girls, buttonholes, corsages, flower crowns and confetti. Sometimes there are accommodation and thank you flowers too. This summer I have learned a lot about organising myself and working weddings around the children. The girls are fantastic and are really good for me on the busy days that lead up to a wedding. They have loved coming with me to deliver wedding flowers when their dad is away working too. At the beginning of this year I had hoped I would be able to supply local florists with my homegrown flowers as well as have enough for my stall and weddings. Unfortunately as the season had gone on this has not been possible this year, partly due to the weather and also wedding bookings that have come in after the flowers have been planted so it is not possible to increase the numbers I am growing. I hope in future years to be able to build on my planning and flower growing so that I will always have flowers available if a local florist needs a particular variety they cannot source elsewhere. The new beds at the front of the garden have been a great success and given me the extra flowers that I have needed. As they have a different type of soil and different aspect, flowers have grown differently here. As autumn approaches I am hoping to improve the soil quality with compost and plan how I can use the beds more effectively next year. In the top flower patch my beds are deliberately narrow so I can cut flowers from all sides which works brilliantly. The beds at the front are much larger and it has been a challenge with horizontal netting in place to reach those central flowers in the beds. This year I have found once again that the strongest performing flowers were those that I plant from seed in August and overwinter ready to produce big healthy plants in the spring. The seeds I sow in the spring are useful to fill gaps but are not neatly as robust as my autumn sown hardy annuals. My cornflowers planted last autumn started to flower in a June and are still flowering now. Not all seeds can be sown in the autumn as they would not survive the winter outside so half hardy annuals and tender annuals do have to be sown in spring. Here are some of the seeds in early September that I had sown in August. Daily life at Cloudberry Flowers is always busy with digging, sowing, planting, staking, deheading, weeding, cutting, conditioning, arranging, pruning, dividing and transplanting going on. I go out in all weathers but some time in the week is spent inside card and confetti making, creating new ideas, research, liaising with brides, learning and squeezing in the odd bit of admin too! A morning last week was spent washing buckets from weddings ready for the next one and weeding the flower patch. The wheelbarrow loads then have to be taken from the top flower patch to the bottom compost heaps at the bottom of the front garden, which helps keep me fit! The weather this year really has been awful for flower farming. We have just had so little sun and lots of damp, rainy cloudy days. Flowers do need sun and warmth to perform at their best. I am so pleased to have come through such a challenging season and still been able to produce all the flowers I have for weddings and customers. I could not have done this in previous years as I would not have been growing enough. The extra beds and flowers I now grow has really helped. Also growing enough different varieties of flower has helped as some flowers have not done at all well with the lack of sun but others have come through. I planted a lot of cherry brandy rudbeckia this year with the sole purpose of using it in a September wedding I had. Not one has flowered due to the lack of sun but I had lots of red scabious, cosmos, dahlias and larkspur I used instead which looked beautiful. This is why it is important to me to never promise a bride a particular flower in her bouquet and you do need to be adaptable if having flowers at your wedding that are seasonal and locally grown. I can promise you some absolutely beautiful flowers but I can’t promise you exactly what they will be! One flower that in the last three seasons since Cloudberry Flowers began that I have never been able to grow is freesias. This year I had some left over bulbs and I thought I would just pop them in a bed and a few pots, plant over them and never expected to see anything come, just like previous years. In the last week I have had freesia flowers in bloom and they just keep popping up! I do like surprises and this has been a good late season one! Helichrysums have been a new flower for me this year too and I love them. They look fabulous in bouquets where bright strong colours are needed. They dry really well. They are strong flowers on strong stems and they mix really well with other late season flowers like dahlias and scabious. It is also nice to gain inspiration and for the first time we went on a family holiday abroad this summer to the Italian lakes. I loved seeing the flowers they could grow there with a bit more heat and sunshine. Their agapanthus were the first thing that struck me, so many and such strong stems and flower heads! The photograph below shows a favourite place we found. Isn’t it beautiful with just my kind of flowers, a meadow full of wild flowers in the garden of an Italian villa. I love my new garden gate stall that Robert built me after the last one had seen better days. Ever since Erin went to school and I have more time for Cloudberry Flowers I have been cutting and arranging flowers for the stall everyday. Robert would often be cutting grass in the evening over the summer and see people coming to the stall but as it was not a weekend there were no flowers on it. So now you can pop to the stall 7 days a week for your flowers. I like to keep the stall open in the evenings until it gets dark as it gives you a chance to pop by if you are walking the dog or after work. For most of us it is far too early to be thinking of Christmas and for me it normally would be as well! However the garage is now full of baskets I have been planting bulbs in which will hopefully have been done early enough they will flower around or just after Christmas, making a lovely present. Last year was the first year I had planted bulbs for forcing. I love the idea, I think the look and smell beautiful but I wasn’t happy with the height of the narcissi and hyacinths as a gift for a loved one. They were too tall and floppy! Staking with pea sticks or branches just wasn’t enough. So this year I have been planting more dwarf varieties of bulbs including iris and narcissi and I hope they will look lovely. I am still growing my tall narcissi but I will use these for Christmas jam jar posies instead. At this time of year the question is how long will the season last? In November last year I was still making up bouquets for customers. I will have to wait and see how long it takes Jack Frost to put in an appearance this year! In the meantime I am going to keep bringing you lovely autumn flowers, clear beds for next year, plant new seeds and get on to the mammoth task of the annual bulb planting. This year I was going to be so good and not buy too many new bulbs, but then the catalogues pop through the letterbox and those tulips just look divine. The temptation was just too much and you do have to plant enough for any spring brides that would like some flowers! The result of my large bulb order will be some gorgeous spring flowers for you to enjoy in your bouquets and jam jar posies in the spring! Bouquets and Jam Jar Posies will be available to order daily until we have a run of frosts and the flowers stop blooming in the garden. The garden gate stall will also be open every day until this time too. Fingers crossed its November like last year!